Slipping cones on the SD50 and the lapping of said cones, are covered in detail if you search the subject in myhanse.com (and other pages). 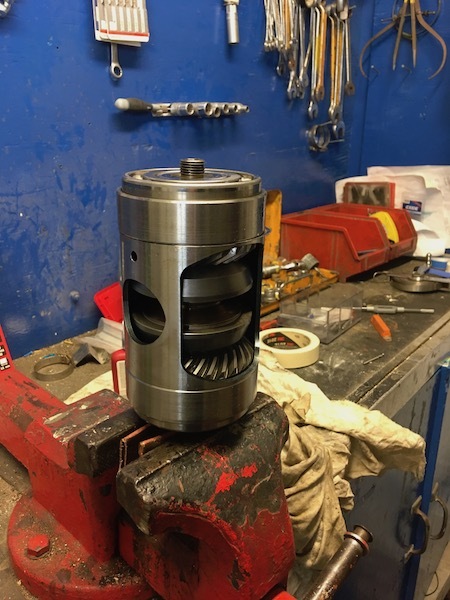 One Hanse owner asked which size "drive shaft socket wrench" he should buy, for mounting the cone gear shaft in a vice. This is a better solution than using alu brackets to protect the steel. There seems to be no answer to his question, so for my own (eventual) future lapping of the poorly manufactured cones, can someone please tell me which size fits the shaft??? Looking at the youtube video mentioned in one thread, I would guess 28 or 30 millimeters. We Scandinavians have the shop "Biltema", where a socket wrench set of three pieces (30-32-36) can be bought for some 35€. If I want a set from 27-36 mm the price will be 80€. The interesting part is the bottom of the drive shaft (18). If someone has the exact size, I could just buy one piece (e.g. 28 mm). The wrench size is 27mm. Sorry I made a mistake when reading: the number I gave is the wrench size for the nut on the top. To hold the shaft into the vice I used pieces of copper tube you cans see on the picture. I did the same when I repaired the cones of myself first sail drive in 2012 in Chile. That's worth. I had some issues with a somewhat meek propulsion when motoring last summer, so maybe I have to do some lapping later. In the autumn though, the propulsion seemed normal. In your foto I guess that the unit placed in the vice represents everything from number 13 upwards to number 10 in the exploded wiew. The cone to be lapped must be number 19, which has friction against the two cups numbered 17 (top/bottom). 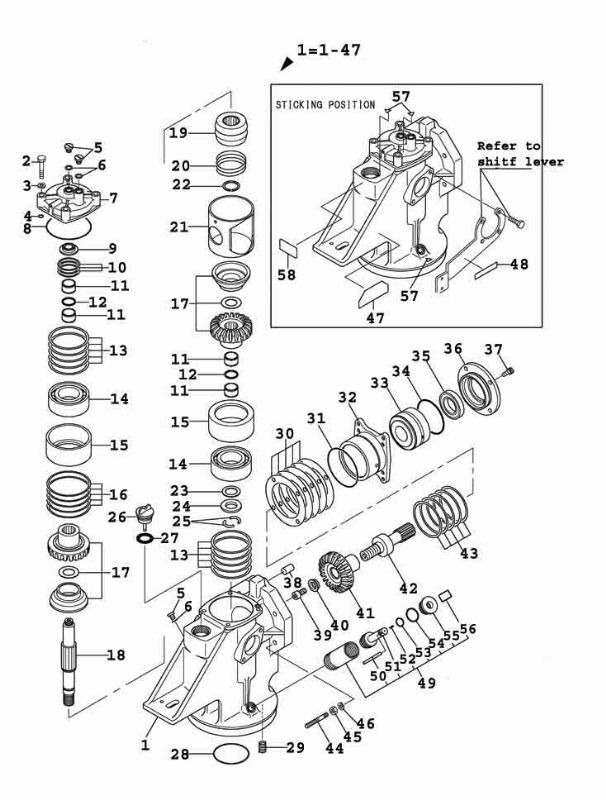 At www.lidingomarin.com I found some prices for spareparts. 9) Nut with left-hand thread €47! I have seen various descriptions/videos of the procedure, but as I remember, 9) and 10) are the only spareparts I will need to buy? Considering that Yanmar has delivered a not-so-good product, I find it very bad-mannered to charge those prices when the customers have to repair Yanmars mistakes. Of course any marine mechanic will get a discount of 40-50% of the mentioned prices, but I will not. When I had to change the rubber-diaphragm back in 2014, I chose to let a professional do the work, because the prices I should pay for spare parts were almost equal to the final bill I recieved. I have mentioned this in a earlier thread. There is an upgrade kit available. This solves the problem permanently. I will use this when my clutch starts to slip. The guy who sells it sends you a full description and everything you need. Seems like a better solution than to relap everything 500hr or so. Instructions on CD covering; Removal, Rework, Cone Lapping, Setting Up, Installation, Adjustment and Oil Level/spec etc. There is also a SPLINE HOLDING TOOL available that makes the Top Nut removal/fitment a LOT easier. Picture is exactly what you noticed. Regarding the upgrade kit, I will investigate deeper. 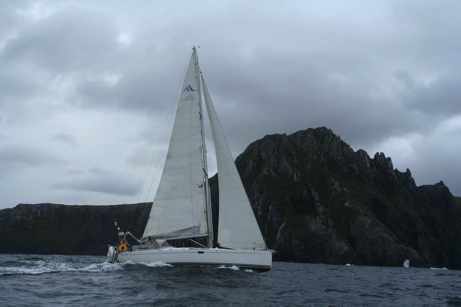 In 2012, after many milles motoring into the Patagonian channels, we started having trouble with the sail drives which eventually leave us to do cones lapping. The sail drive had 1700 h of running time. It worked perfectly until New Zealand where unproper change of the lower bearing by a "professional" in Tahiti lead to breaking of the pinions. I changed the whole sail drive in Auckland in 2014, and since we sailed to France. Last year in 2018, after some 1030h the cones started to slip as we were cruising in Norway. Eventually I found a place in a private marina near Aalesund, with a work bench! and I did it. It took me less than one day, all included! I knew the tricks. Having done two times on the same type and model, I came to the conclusion that the cones were not lapped properly as from the beginning: I have a strong mechanical background, particularly on engines and gears, and when I was doing the lapping of the cones, my adjustment by hand was far much better than the automatic one done originally. Anyway, It is not a very hard job to do.